Come feel the aloha spirit with SoBe Surf and Paddle near Cocoa Beach, Florida. Our Cocoa Beach Area shop is located in the heart of Merritt Island at 635 S. Plumosa St.. Our Waterfront Rental, Tour and SUP Yoga (Paddle Board and Kayak) business is located near the shop, at the amazing Brevard Veterans Memorial Center and Park, 400 Sykes Creek Parkway, Merritt Island Fl 32952, only 3 miles from Cocoa Beach, and 5 miles from the Port Canaveral Cruise Ship Terminal. We offer unique, quiet access to the water with a safe launching area (no noisy jet skis allowed). You’ll find a full-service experience with outstanding staff, great equipment and a perfect natural environment of the Banana River Lagoon Wildlife Refuge. 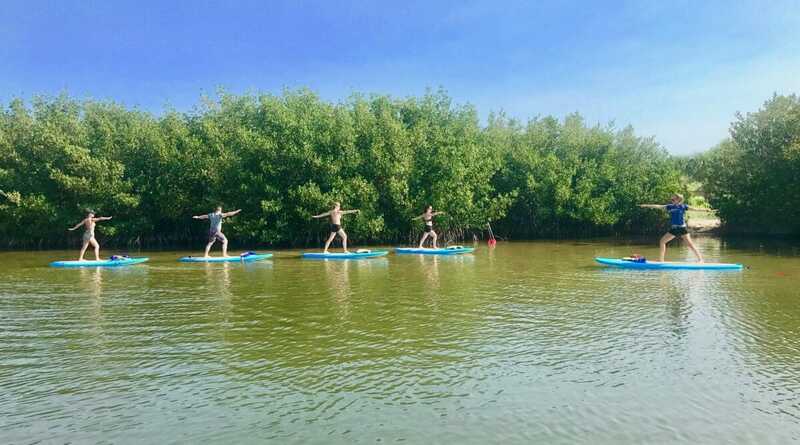 Stand up paddle yoga is a great way to diversify your yoga practice, find daily inspiration, get fit and have fun! Classes are taught by local yoga teachers. This is a fun and relaxing class that is sure to take your yoga practice to the next level. To register for SUP yoga at Sobe Surf, simply book online by clicking the “Book Now” button on this page. It’s that easy! If the 3 person class minimum isn’t met by 6PM the previous evening, we will notify you of the cancellation and refund your payment (or apply it to another class reservation if you like). SUP Yoga classes cost $30/person including all equipment and last for one hour. We offer classes at 9:30AM on Tuesdays, Thursdays and Saturdays. Gratuities are always appreciated if appropriate. 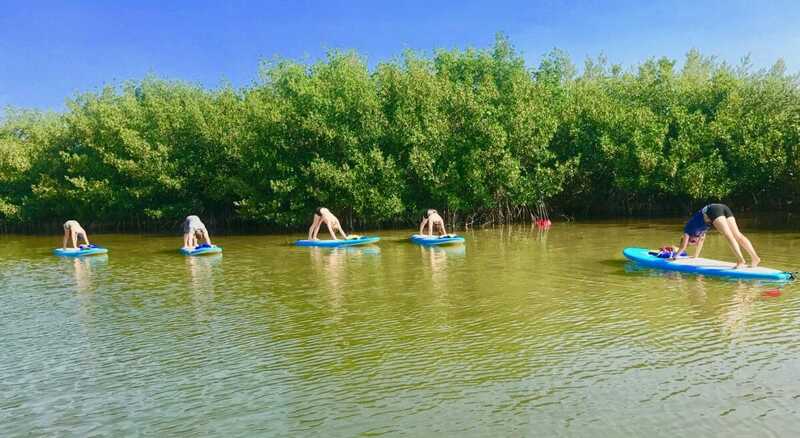 Our SUP Yoga classes meet at our waterfront rental/tour business location, Brevard Veteran’s Memorial Center and Park, 400 Sykes Parkway, Merritt Island, Fl 32952. The launch is just behind the museum so park by the building and look for us on the right side where near our equipment trailer. The museum has restroom facilities. We look forward to seeing you there and having a great time in the water! 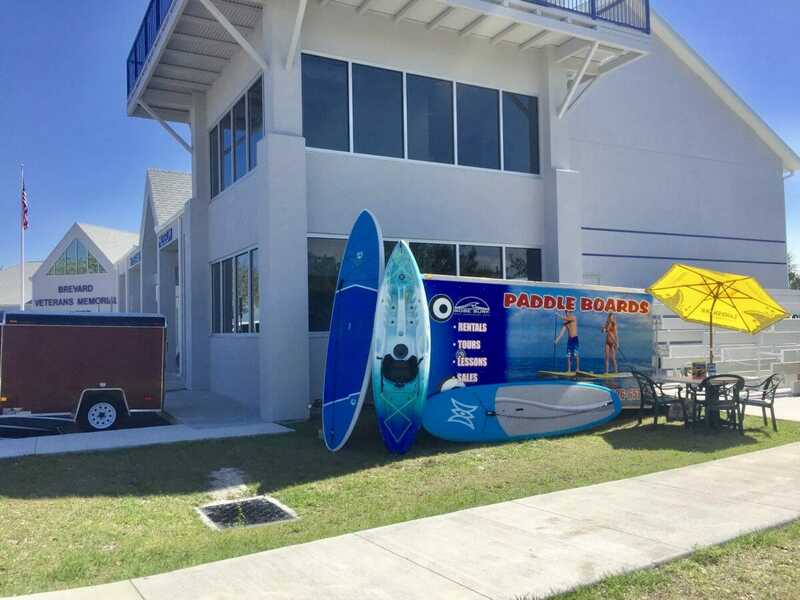 Our Paddle Board Shop is located just a half mile away at 635 S. Plumosa Street, Merritt Island, Fl 32952 where we have great deals on our massive selection of Paddle Boards. Free class or lesson with each Standup Paddle board purchase! Buy a Paddleboard for Yoga at our Merritt Island Shop, located at 635 S. Plumosa St., #11, Merritt Island, Fl 32952! Quality lite weight Paddle Board and Carbon Fiber Paddle for under $1,000 including free class!